I have received so many messages and emails asking about our new hardwood flooring. I am really excited to share our choice with you today. We researched many companies, styles, and types of flooring. It was by far the hardest decision we had to make, when building our new home. Deciding whether to go with light or dark floors, narrow or wide planks, etc. It all was so hard. 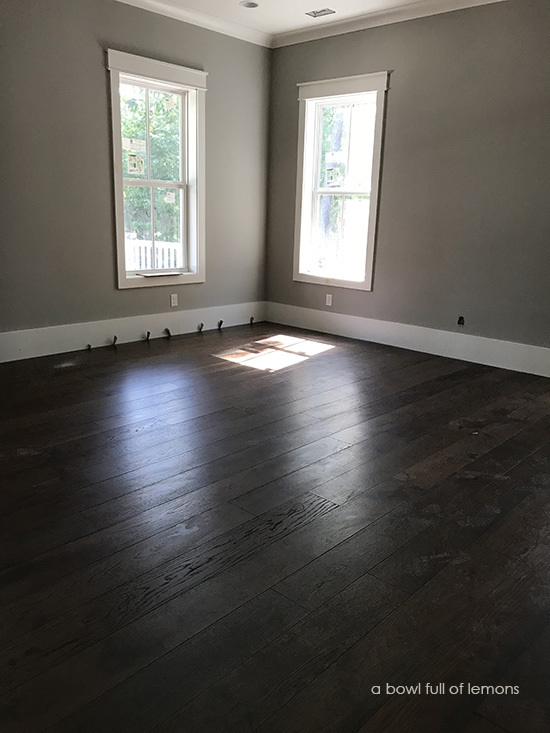 I wanted flooring that would exude a classic and timeless look and something that looked like it had been there for many, many years. After much research, we found what we were looking for –> Armstrong TimberBrushed Flooring. Armstrong Flooring had exactly what I had envisioned in my mind. I wanted a wide plank (7″) etched hardwood with a classic color that would compliment my decor. I found everything I was looking in the Armstrong TimberBrushed line. The color we choose was deep etched Hampton Brown. 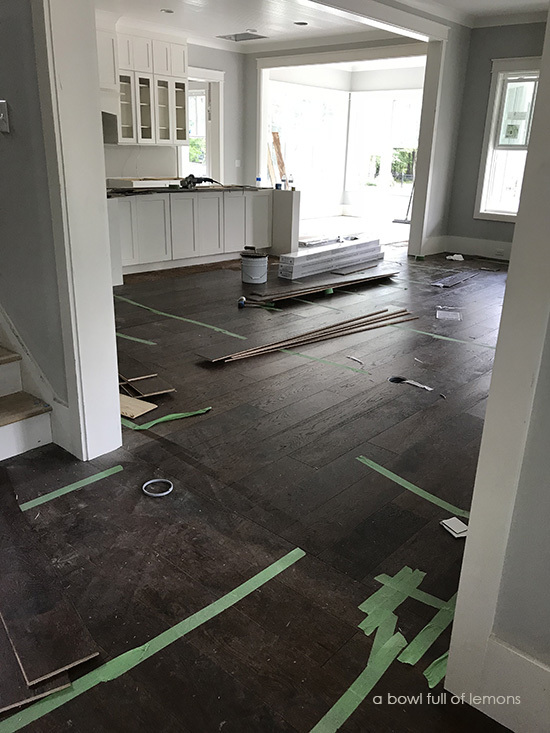 Because we have a raised slab foundation, we went with a engineered hardwood floor. It is a beautiful and classic floor and I am so happy with our decision. Installation went really fast. 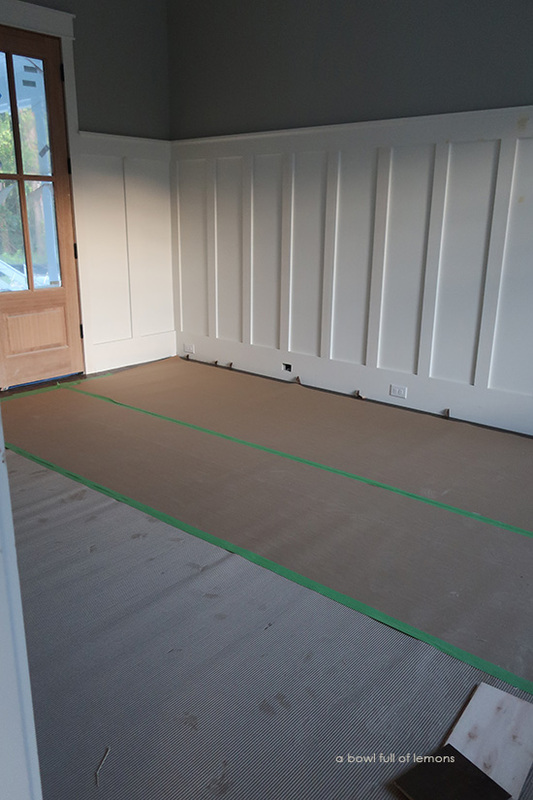 Due to the nature of the raised slab, the installer glued the floors down. They continued the glue upstairs as well. As you can see, the TimberBrushed flooring has a brushed wood texture. The soft portion of the wood is gently brushed away, exposing the grain and drawing attention to natural knots, filled splits and lively grain patterns. 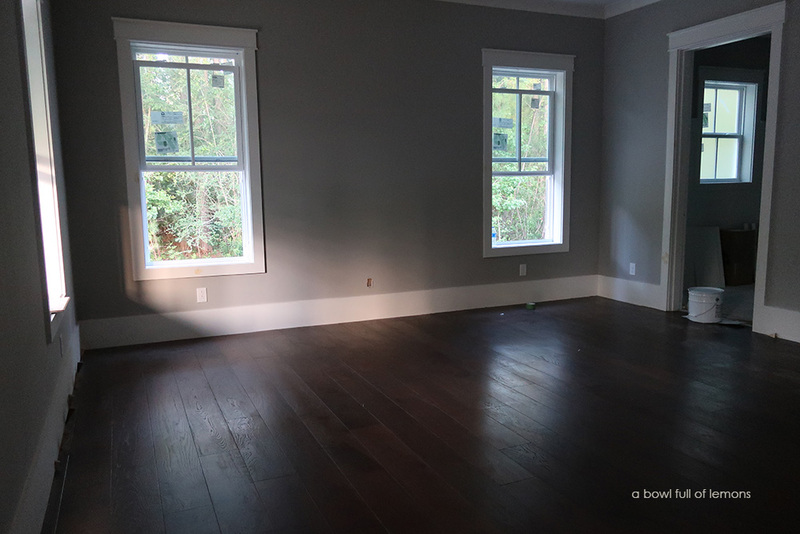 Our master bedroom floors look spectacular with the mindful gray walls. 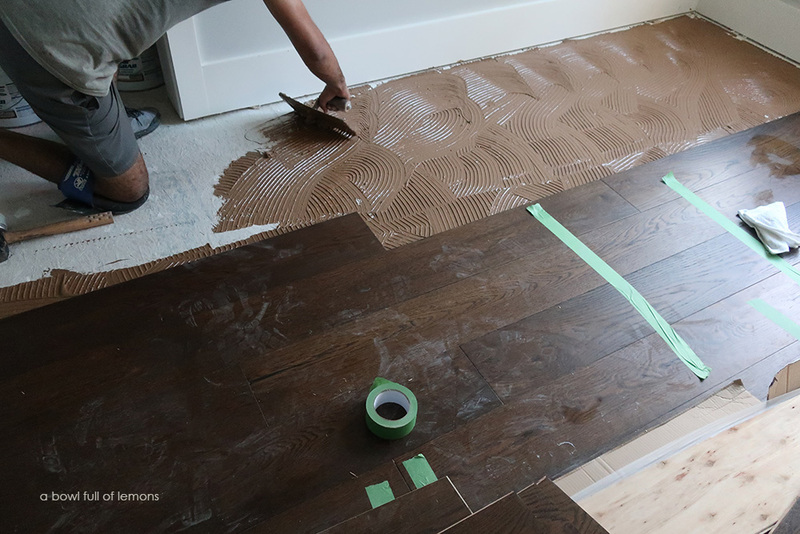 Once the flooring was installed, the guys covered it to protect it from final work that had to be done in the house. Working with Armstrong Flooring has been such a pleasure. From ordering the samples to setting up delivery, everything went so smoothly. If you’re interested, Armstrong Flooring has a flooring photo gallery to help give you ideas and inspiration. 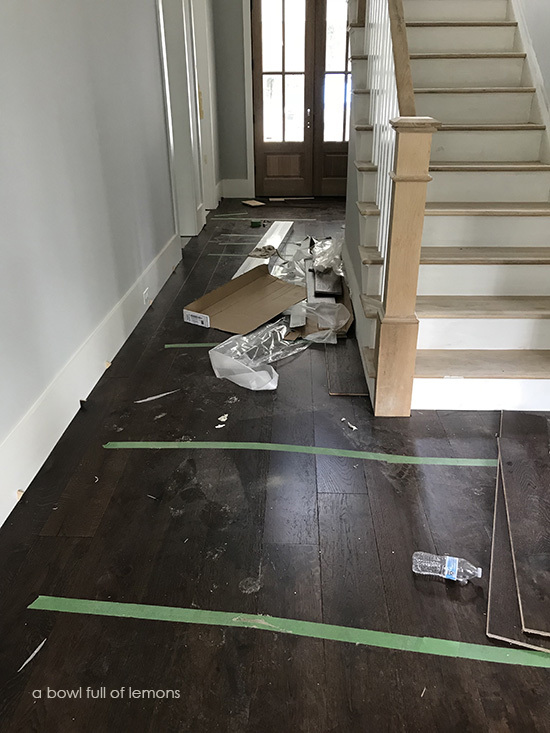 They also have a floor finder where you answer a few questions about your project and based on your answers, they will recommend a product category that best fits your answers. They make it easy to shop and I am so thankful for that. 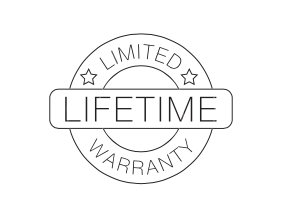 Armstrong Flooring is backed by a lifetime limited warranty and protected by a lifetime finish for scratch, stain and wear resistance that keeps floors looking newer, longer. Thank goodness, that is something I don’t have to worry about in the future. 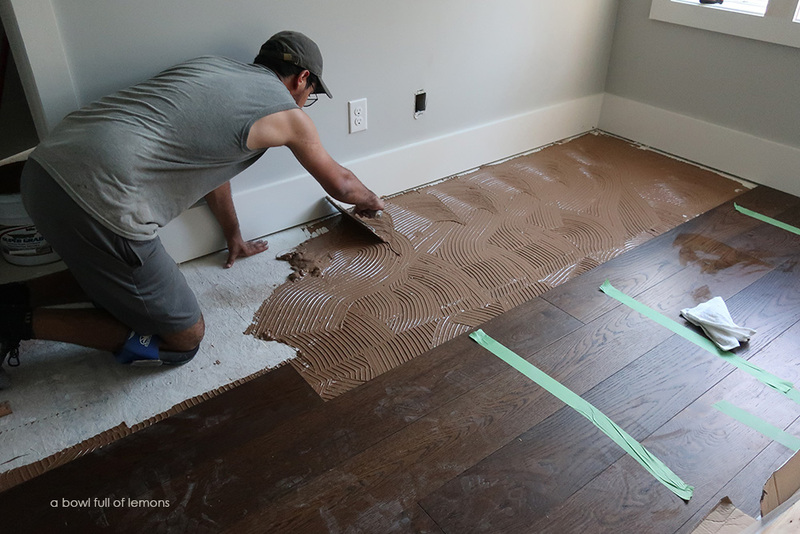 Next week, I will share the finished product with you and show you just how lovely this Armstrong flooring looks once installed. For now, have a blessed day. Disclaimer: This post is brought to you by a partnership with Armstrong Flooring®. I received this product from Armstrong Flooring®. All opinions are my own & I only recommend products or services I use personally and believe my readers will enjoy. I am disclosing this in accordance with the Federal Trade Commission’s 16 CFR, Part 255: “Guides Concerning the Use of Endorsements and Testimonials in Advertising. Please click here for full disclaimer.